This guide is a review of a climb by Dave of Mt. 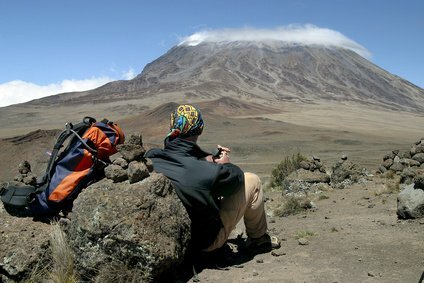 Kilimanjaro, Tanzania. This article focuses solely on the climb with little other detail about travel in Tanzania or other travel information. Look for the following articles about eastern Africa on Dave’s Travel Corner: Zanzibar, and information about the peaceful town of Lamu on the Kenyan coast, just south of the Somalia border. Mt. 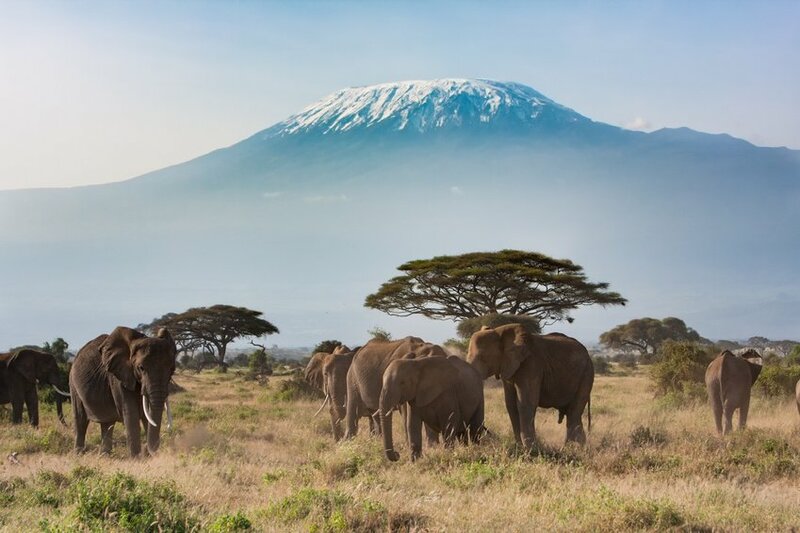 Kilimanjaro sits just north of the Equator in Eastern sub-Saharan Africa. It rests on the Tanzania-Kenyan border and stands 19,340 feet tall (5895 meters). It is the world’s largest freestanding volcano and one of the world’s seven summits (the tallest mountain on each of the 7 continents). When initially researching climbing companies I found ten, of which I would eventually choose one. For the price, the route, the guides, and service Dave chose Mountain Madness. Many of you may remember this company. They were featured in news stories during the spring of 1996. This was one of the companies that was guiding during an ill-fated day when tragedy hit Mount Everest. “Into Thin Air” a book by Jon Krakauer, was based on the incidents that occurred on Everest during May 10, 1996. Dave chose Mountain Madness because of their slow climb schedule, which left more time for acclimatization. They have a good client to guide ratio. They were climbing the least traveled route. They have a good overall reputation. There are several routes on Mt. Kilimanjaro. They are the Machame, Umbwe, Mweka, Marangu, and the Shira plateau route. By far the most popular, fastest to the top, and cheapest route is the so-called “coca cola” route. I highly do NOT recommend taking this route. While it is cheap, and you can organize a climb on the fly, you will most likely have problems, with the guides, the food, and the altitude. Time and time again people have told me about their bad experiences on the “coca-cola” route. They said they took this route because they didn’t want to spend a lot of time on the mountain and they didn’t want to pay very much. I bring up the old adage at this time “you get what you pay for.” Many had tales of guides abandoning them, bad food and bad water. Most had stories about climbing too fast and getting altitude sickness. Of the people who attempt this mountain only approximately 20% actually make it to the top. One of the reasons for this low percentage is that most people take the “coca-cola” route.